Therapeutic use of Tarragon Essential Oil provides antibacterial properties as well as helping with digestive ailments and circulatory issues. 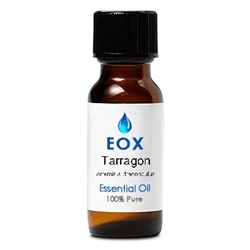 Tarragon oil is anti-rheumatic, antioxidant, and eases menstruation discomfort. A colorless to pale green/yellow liquid with a herbaceous, spicy, warming, opening scent with a hint of anise and fennel that is highly reminiscent of the familiar scent of tarragon. It blends well with Basil, Galbanum, Lavender, Ginger, Pine, Vanilla and other herbal scents. Externally the oil is relatively non-toxic; it can cause acute local irritation and possible sensitization in some. Use in dilution only with care, in moderation. Avoid while pregnant. Should be avoided if epileptic.